Let's start the day by putting some pictures of sleeping people...hehe. Mommy Recel tagged me on this one. Tag is quite simple....post a picture of you or someone else sleeping. I have a collection of pictures where our little one was caught snoozing so if I put them all here, it's going to take forever. I chose the ones I already have here on my 'puter. I actually posted these pics before for no apparent reason...har har har. 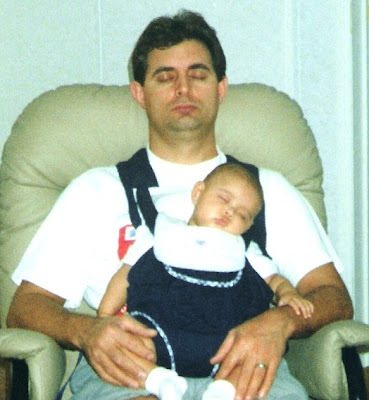 The hubs and baby...taken in 2001. Don't know who's more tired! Our little one when she was a few months old. Isnabera, ha? She was a little over a year old here. 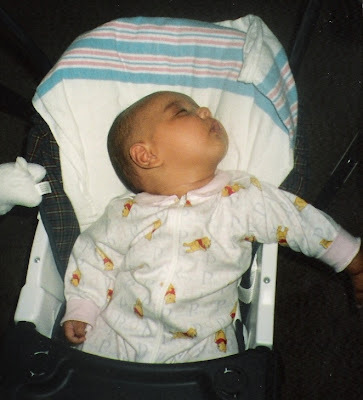 Sleeping position is still the same. Here she is now...and yes, she puts those blinders every night. Not sure why. Me? You didn't think I would post a picture of me sleeping here, did you??? I don't think so. 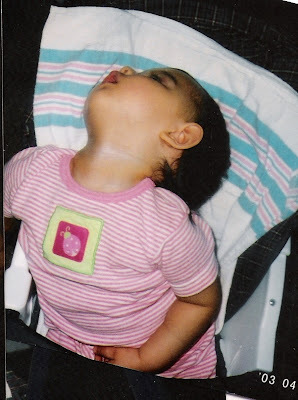 Let's see...Nancy, Emma, Emzkie, and Ritchelle....care to post pictures of sleeping beauty in your blogs? hehe... parang parehog pagod si daddy at baby dyan! thanks to the carrier, eh? nau.. sobrang isnabera nga! lol grabe.. bakit ba halos lahat ng babies ginaganyan nila yung ulo nila? w/ triz before, ako yung nasasaktan at napapagod eh. awww! ang cute naman nyang recent photo grabe. dalagang-dalaga ang dating. hehe... i think that'll help her sleep earlier. ewan.. just a thought. we did it before with a pamangkin who hates sleeping eh. haha makatula la reng pic da da reng mitata. Cute Jul. Yong baby girl mo parang si Frankie din kong matutulog. I hope she is feeling better. Naka flu nga din kaming dawala ni Frankie. One week with the 102-104 temp. nakakapanic pero at least he is back to normal sa kakulitan. TC! hi Juliana! I already did this tag. Its in my Blogspot. thanks for tagging me! !